21 Blunt Questions for a Life Coach. A Story of One HeartWork. What is life coaching? What are the most common problems people struggle with? Is there a universal recipe for a happy life? An interview with a life coach Danielle van de Kemenade. Imagine, next time your grandma asks you how things are you tell her you hired a life coach. Depending on how much of an outspoken person your grandma is, she might either think or tell you right in your face that young people these days have become very lazy. They now need a coach to tell them how to live their life! Back in her days, she might add, you grew up, you married, you had kids, then grand kids, baked tasty cookies, maybe worked somewhere down the road a little. Why should you need a life coach? Here’s your life. Live it! How complicated can it be? Well, dear grandma, back in your days, everything was different. You lived in another universe. There were also no computers, no internet, no smart phones. People were born, married and spent their whole life in one village, city or at least country. Life was slow and predictable. If you want to know how speed of light feels like watch how fast everything new becomes old. Start with your iPhone. The amount of choices on each and every thing can make a simple decision about breakfast a stressful experience. And for women, it’s a whole new world of possibilities in a highly competitive and rapidly changing environment, where men have been practising their strategies for ages. What to study? Where to live? To have children or not? How quickly to come back to work from the maternity leave? Probably as soon as possible, otherwise that weasel Ethen is going to get your promotion. But accounting bores the hell out of you! Is it possible to start from scratch with 2 kids and do something that makes you happy instead? Choices. Big and small. Important and unimportant. Time critical, life changing, irreversible. You need two hours to choose between two sweaters in a shop. How are you supposed to make all these decisions? A sweater you can at least exchange! Favorite Quote: Be a light, not a judge. Follow Danielle on: Facebook, LinkedIn and Pinterest. Meet Danielle van de Kemenade, a life and career coach for women. She can’t tell you what to do for a living, but she will help you discover it yourself. She can’t make you rich, but she will help you find opportunities to do better. She can’t make you happy, but she will help you find your own way to your own life well lived. What is life coaching? Is it some kind of motivational voodoo that makes you feel happy about yourself for an hour? Or is it something that can change lives? 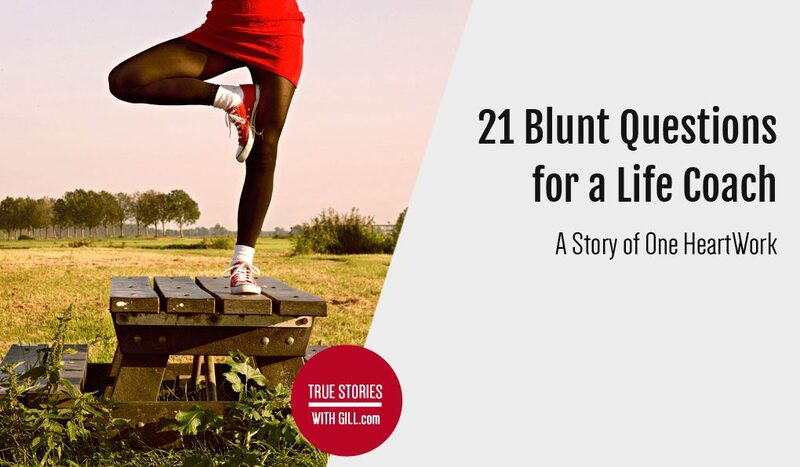 Find out after these 21 blunt questions I asked Danielle (and surprisingly enough, she didn’t stop talking to me after this). Gill: I know you dedicated a whole post to this, but could you please summarize in a couple of sentences: What is life coaching? Danielle: Life coaching is a way of personal development, whereby a life coach helps you come up with your own answers and strategies to realize certain goals. It’s an intense way of working together to help you create a more fulfilling career and life. Gill: You obviously need a life coach when there is something about your life you are not happy with. How do I know I need a life coach and not, let’s say, a psychotherapist? Danielle: A life coach is someone who will work with you on your future, not on your past. If you’re mentally well but need some support in creating opportunities for your future or achieving certain goals, a life coach is the person you are looking for. Women in ‘the East’ struggle more with society, whereas women in ‘the West’ struggle more with themselves. Gill: You worked both in Europe and the Middle East. What are the most common problems women from Western countries come to you with? Danielle: My clients are mostly university-educated, ambitious, ”wanting-to-make-the-world-a-better-place” European women. A common problem they have is, for example, not feeling fulfilled, but not being clear about what it is they’d love to be doing. Also, even if they know what they want to do, they sometimes don’t know how to make that happen. Sometimes they have too high expectations of themselves and feel like they can’t live up to them: they are afraid to fail, not make enough money, think they are not experienced or skilled enough, etc. Gill: How does this compare with the problems you saw women from ‘the East’ struggle with? Danielle: The women I worked with in Egypt were very successful and experienced entrepreneurs and leaders of non-government organizations. The things they struggled with were more on a macro level: government procedures, finding skilled staff, etc. At the risk of grossly generalizing, women in Egypt or ‘the East’ struggle more with society, whereas women in ‘the West’ struggle more with themselves. At the same time, I’m currently mentoring an inspiring young woman from Cambodia, and her struggles seem to be a combination of the two: within herself and with society. You can say that the things women mostly struggle with vary according to their personal situation: socio-economic class, cultural framework, education level and country’s development level. Gill: Can you demonstrate a typical exercise you do with your clients? Danielle: A lot of women I work with struggle with defining what it is they really really want to do. Often times they have two options in mind that they feel torn between, and they keep on going back and forth. An exercise I like them to do at this point is to pick out two locations in the room they’re in (I usually conduct my sessions over Skype, so we’re in different rooms) and to assign a particular decision to each location. I’ll then ask them to go to one location (a corner of a couch, for example), to close their eyes for a minute and to notice in their body and mind what this decision would feel like. Then they move to another location and do the same there. This might not sound very earth-shattering, but it’s a great exercise to help you get out of your head and simply try to experience the consequences of a particular decision. It has helped previous clients make career decisions that they’ve been struggling with for months. Vulnerability and self-awareness are fundamental parts of personal growth. Gill: On your blog, you talk about your personal life in great detail: your achievements, but also your struggles and setbacks. Aren’t you afraid that your potential clients might read it and think, “Oh, she doesn’t have it all figured out even for herself” and won’t hire you? Danielle: I write about myself and my personal struggles because I’d only consider working with a coach if I felt they “practiced what they preached”. By sharing both my achievements and my struggles, I hope to demonstrate that there’s no magic bullet to fulfillment. It’s a work in progress. I also believe that vulnerability and self-awareness are fundamental parts of personal growth. By writing about my struggles and successes, I’m modeling the kind of vulnerability and self-compassion I recommend my clients to have as well. As a life coach, I don’t need to be an expert in your area of work to help you find your own answers. I work from the basis that you are the expert on your own life, whereas I am the expert on the coaching process. By using specific techniques and exercises, I will help you get clarity and move forward. For example, I previously coached an opera singer on her career. I don’t know anything about opera, but I do know a fair bit about ways to market yourself, stay motivated and feel better about yourself. My knowledge, combined with her knowledge on how the opera sector works, helped her attract more singing jobs during our coaching sessions. Gill: Your blog posts are very often in one way or another related to women’s empowerment. What meaning do you personally put in these two words? Danielle: Feeling empowered as a woman to me means feeling that you have the power to decide over your own life. Literally: having power. A lot of women, not just in ‘the West’, hold themselves back due to insecurity and fear. Naturally, there are bigger societal obstacles to women’s advancement as well, but I’ve found that if as a woman (or a man) you feel that you have the power to decide over your own life, external obstacles are a lot easier to overcome. Gill: I know that when you moved to Germany and suddenly found yourself staying home without a job you had a tough time making your peace with it. Why was it so? Are a staying at home wife and an empowered woman two opposite things? Danielle: For me, it was and currently is. I gave up a dream job to move to Germany to be with my husband. But even though I had quit my job, I didn’t want to quit my career. In the beginning, I faced a number of practical obstacles while starting my own business that were frustrating. Add to that the fact that I was responsible for most of the household chores, because my husband had just started his job and was exhausted in the evenings, and I felt like I’d ended up in a 50’s household setting. I think it’s up to every woman to decide what gives her peace and what makes her feel empowered. However, I do think that, for your own security, it makes sense to keep developing yourself in some way – whether in a job, study, own business, volunteer placement or otherwise. Calling myself a rebellious woman is owning up to the fact that my values are important to me, even if it means being considered ‘weird’ at times. Gill: You call yourself a “feminist” and a “rebellious woman”. What do you exactly mean by that? Danielle: I call myself a feminist, because I believe that women the world over have less opportunities for a safe, fulfilling, independent life than men. A lot of people think that being a feminist means that you’re a bra-burning, man-hating, whiny critic. But just like any stereotype, this grossly exaggerated image is hardly representative of feminism. At its core, calling yourself a feminist is owning up to the fact that our society treats women and men differently, and that women will usually get the short end of the stick. I call myself a rebellious woman, because I feel that the choices I’ve made in my career and personal life are different than most women in a similar situation would have made. I moved away from my parents when I was 12 to attend boarding school. I studied Comparative Women’s Studies, perhaps the least career-savvy Master ever. I re-created my career several times in different countries. I married someone from a different culture and religion. And I recently shaved my head. My entire life I’ve tried to be as true to my values as possible. Calling myself a rebellious woman feels like owning up to the fact that my values are important to me, even if it means being considered ‘weird’ at times. Gill: Speaking of “different” choices: At the end of the year, you’ll be going to Tanzania to work pro-bono for 7 weeks paying all the costs by yourself. Why? Danielle: Because I miss having an impact on a larger community. Before becoming self-employed as a coach for women, I worked as a social worker and as a development worker. Because I also love what I do as a live coach, I started looking into short-term women’s empowerment consultancies in Europe, Africa or the Middle East that I could do on the side. When I came across a volunteer vacancy for a Gender & Entrepreneurship Innovator in Tanzania I loved the task description so much that I decided to do it regardless of the lack of pay. I will be working with a non-governmental organization to help them empower more women in their community as well as coach a group of young female entrepreneurs on how to grow their businesses. Gill: Tanzania is quite different from the West and even from Egypt. Why do you think you will be able to help? Which problems are you hoping to solve? Danielle: I’ll be able to help women in Mwanza in the same way I’m helping women in Germany, in the Netherlands or Egypt: by listening to them and helping them come up with solutions to the obstacles they face in their community or personal lives. For example, if a woman entrepreneur tells me she’s struggling to sell her goods on a local market, I’ll encourage her to analyze what successful sales(wo)men on the market are doing differently. If she’s struggling to find funds to grow her business to support her family, I’ll encourage her to look into microfinance opportunities. By encouraging those women to believe in themselves more, to create a community of support and to come up with their own solutions, I’ll help them create more fulfilling lives for themselves and their families in the long run. Gill: I know you are fundraising the money to cover your travel and living costs in Mwanza. Gill: How much money are you hoping to raise? Gill: How much have you raised already? Danielle: 12 awesome people have already donated 945€. Gill: I’m the awesome person number 4! I usually keep this kind of things anonymous, but to demonstrate that it’s not only (lots of) words from my side: my name is right on this list of contributors (scroll down). Also, it looks like I’ll be getting a postcard from Mwanza! Danielle: Exactly! Starting from a donation of 25€, you will stay up-to-date on this project in various ways, and a generous donation of 100€ will even get you a personal 1h coaching session. Gill: But why go through all the fund raising trouble? Do you really think that you’ll be able to raise all 3000€? Danielle: Although I’m in a privileged position to pay for it from my own pocket, I’d like to inspire people to donate so that whoever can’t put their current tasks on hold and leave to fight gender inequality and youth unemployment in person can also contribute. And yes, I do believe that there are enough people who care about these things to help. Moving on to our next topic: Prior to this interview I asked my readers whether there is something they’d like to ask a life and career coach. Are you up for some questions from the audience? Danielle: Absolutely! Bring it on! Gill: Ok then. We’ll start with a fundamental one: What qualifies you to be a life/career coach and what advice do you have for somebody who wants to be one? Danielle: Great question. Coaching is not a regulated profession, which means that theoretically, anyone can call themselves a coach. I, however, completed a coach training program with the Institute for Life Coach Training after I’ve been using techniques to help women as a social worker for 2 years. The only thing that prevents you from being successful is not doing whatever is necessary to make it happen. To anyone who’s thinking of becoming a coach, my number one advice would be to get experience in coaching. Read books on coaching. Find willing guinea pigs for trial coaching sessions. If you like it, only then invest in a degree. Gill: What are 3 things that one should get rid of to succeed the most in leading a balanced and happy life? Danielle: First of all, everybody’s definition of success is different. For example, for one person success is becoming a CEO before the age of 35. For another, it’s to raise a happy family. A work/life environment that makes you feel bad. People that bring you down. Being guided by your ego and its little voice in your head that is telling you you’re not good enough, you’re being too selfish, you shouldn’t give that crazy plan a try, etc. But simply eliminating things isn’t sufficient. You need to make sure that particular things are always present in your life as well. Here’s my recipe for a Life Well Lived. 1). Start by kneading your Self-Awareness. Self-directed change to create a more fulfilling life is only possible when you know who you are and where you intend to go. Do this for example by reading books, talking to others, writing a journal. 2). To firm up your Self-Awareness, add a handful of Authenticity. Dare to be the person you dream of being. Figure out and pursue your true passion. Do what you love for a living rather than working for the weekends. 3). When your Self-Awareness and Authenticity mix starts to crumble, add 2 table spoons of Ego-Softener. Get rid of that nasty little voice that says you’re not good enough. Do this through meditation or mindfulness exercises, being self-compassionate and asking for help when you’re stuck. 4). To smoothen your mixture, slowly stir in half a litre of Gratitude. Learn to see each obstacle as an opportunity to grow. You are immensely blessed. True happiness lies within yourself. 5). Finally, to let your mixture rise, add a pinch of Bravery. Dare to fail. Go beyond your comfort levels. Put yourself out there. It’s the only way to grow. 6). Enjoy your recipe for a Life Well Lived. Best served with love and patience. Keep in mind that without Gratitude, this recipe will slump at the first change of temperature. Keep on blending it regularly into the mixture to enjoy your Life Well Lived the longest. Gill: Next question is something many of us struggle with on a daily basis: How to stick with to-do lists and schedules? Danielle: First of all, there’s no ‘one-size-fits-all’ solution. The same schedule may work differently for different people. But one thing that’ll most probably help everyone is a semi-flexible routine. For example, one of my clients struggled to find the time to work on her novel during the week. In our sessions, we came up with a rule that she would write 2×2 hours a week, no matter what. Having that number to stick to, but also the flexibility to decide what day to do it on motivated her to simply pick up her pen and start writing. Gill: Danielle, this has been a wonderful talk! I know I got a lot of my questions answered, and this time I also know we’ve managed to answer a lot of questions from others. Thank you very much for agreeing to do this! Here comes our last question (and then I’ll let you go have a rest after this “verbal workout”): Which piece of advice do you dole out most often and why is it so important? Danielle: Listen to your gut and do the work to make it happen. Because at the end of the day, each person knows best what’s important for them – be it money, authenticity, integrity, recognition, whatever. Previous post Modern Teenagers and How to Be Friends with Them. A Story of One Age. Next post Absent Fathers and Their Children. A Story of One Void. I’m glad you find it useful. Both, the content and the presentation on the blog. I too continue learning myself. These quotes for example that you can tweet are relatively new. Another great interview. And Danielle, I’m happy to meet you too. I am a blind blogger and coach. I don’t have the formal training you have, but do think getting it would be a great addition to my life experience and positive attitude. I loved your description of what a coach is. It’s a big help, as most people including other coaches don’t necessarily know what a coach is. And I agree completely with what you said about sharing openly on your blog. My own open and honest posts get great responses even if they do sometimes surprise a newer reader. Looking to learn from you and hope we can connect outside this post. Thanks again to you and Gill. Thank you for your kind response. I took a look at your website and found your story (and your words) very down-to-earth, relateable and inspiring. I’d love to hear more of your story. Feel free to contact me through my website.